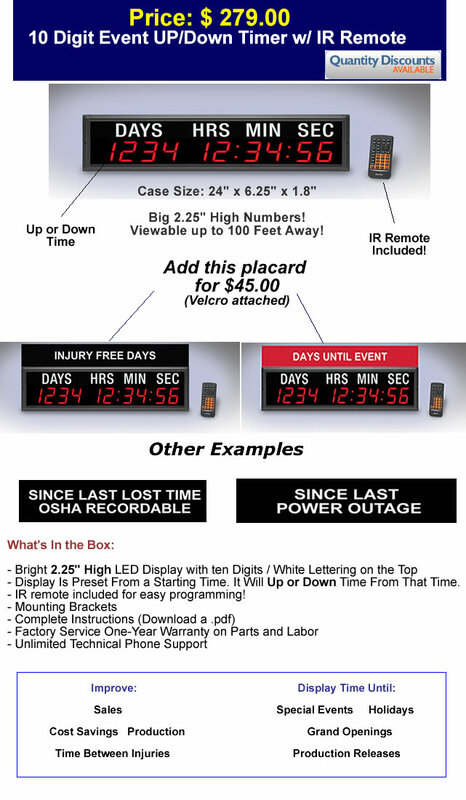 Dimensions: 24" L x 6.25 H x 1.8" D. 10 Digits / 2.25" High Numbers with IR remote for Easy Programing. This model will display real-time information to your employees or customers. The display will up time OR down time in DDD HH:MM SS. Please contact us about volume discounts for distributors, resellers, or OEMs. Availability: Usually ships in 2-3 business days ARO. Standard UPS Ground shipping. Call for expediting options.